We took a nice long walk to Notre Dame this afternoon while Colin napped in his stroller. Brian took all the photos as my hands were cold. Very impressive massive cathedral, but nothing like the one in Mexico City (that one is hard to describe). Good thing Disney has taught us about this one. 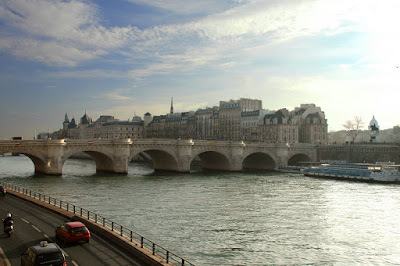 A view of the Pont Neuf and Ile de la Cite from our walk to the Cathedral.